The Megapump range is available in a comprehensive range of skids, trailers and pontoons. The skid, trailers and pontoons are all engineered to suit specific site requirements through our own in-house engineering division. The Megapump skid is available in three ranges and sizes. Each range has been specifically engineered to suit the specific recommended site application. Light Duty Range – this size is suitable for most civil, hire and government utility applications. Medium Duty Range – designed and engineered for heavy civil construction and some light mining application. Heavy Duty Range – designed and Engineered for all mining applications and can be used with suction derrick if required. 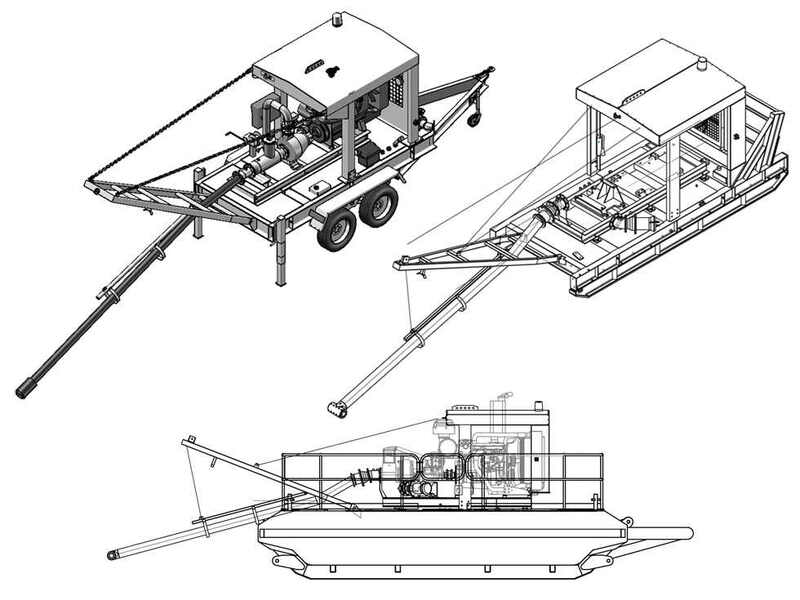 Megapump trailers have been design registered and engineered to suit light civil and government utility applications or for the heavy mining requirements. Eneraque designs, builds and commissions our own range of Megapump pontoons. With engineering excellence, it has ensured that every aspect of the maintenance programmer, installer or water management specialists has been considered. The design ensures minimal freight cost to site while assuring quick efficient commissioning and long life use. Each pontoon is carefully designed for the specific site requirements.